A little brighter than yellow, almost like a golden drop of sun. On top an inch of white patchy head relaxes. The aroma is modest, clean cut, spiced, tangerine, and a zest of lime. The IPA base does show itself with tangerine and grapefruit notes, done in a clean way without hammering the complimenting spices and lime into the ground. The lime sticks itself out, providing a distinct accent to the beer. Something else sticks out as well, but I can't put my finger on it. It reminds me of tree sap. Anyway, the beer is clean, medium bodied, and a more than decent twist on the common IPA. 22oz bottle. Nice ode to the US navy's frogmen, i.e. underwater specialists. This beer pours a moderately hazy, and fine sediment-strewn bright golden yellow colour, with two fingers of flatly puffy, loosely foamy dirty white head, which leaves a decently scraggly array of stucco lace around the glass as it evenly subsides. It smells quite strongly of complex citrus - mandarin orange, lime, a smidgeon of grapefruit - over a fairly sweet bready caramel malt, with some further floral and pine hop notes, and a hint of warming alcohol. The taste is also heavily beset by a sharp citrus zestiness - vegetal lime, orange rind, and lemon pith - but is quickly shored up by a grainy, crackery, and still bready malt backbone, with a rising boozy floral character, and subtle hints of pine forest floor detritus. The carbonation is actually rather evident, at least optically, as there is a constant stream of rising effervescence long after the initial pour. On the tongue, the bubbles are lightly fizzy, and mildly spritzy at worst, the body a decent medium weight, the acerbic fruitiness taking too much of a toll on an otherwise admirable smoothness, I gather. It finishes off-dry, the malt still having skin in the game, which the zesty lime, orange, and lemon fruitiness continues to scrape away at. A tasty fruit-forward, yet still competently bitter, IPA. Nice to try a version where the citrus notes are a wee bit different from the norm - as much as I like my grapefruit, mixing it up is good from time to time, and this one very much delivers on that. Worthy of a go. A: Poured from a bottle to a pint glass. Had a yellow color and a cloudy consistency. Lots of sediment. There was a half inch of foamy head that lasted a fair amount of time. Good lacing. S: A decent enough aroma of hops, citrus, and a floral element. T: Tasted of citrus (a bit of grapefruit), the floral quality, a surprisingly low amount of hops, and a bit of malt. Not quite hoppy enough for an IPA. A pretty good flavor, if a little thin. M: A good amount of carbonation with a somewhat slick finish. Medium-bodied. O: This is one of those IPAs that's certainaly drinkable, but isn't as strong as some others of the style. A- Frog's Breath pours out beautiful with a burnt orange, bright gold color. A good two fingers of off white/tan head rises up quick and stays, leaving a rocky mountain look on the top. Great lacing and no sediment seen floating. S- Smelled it as soon as it came to me. This IPA is rich with hop scent giving off big juicy citrus and tropical fruits. A bit of sweetness, almost candi like from the malts, but it's quite masked under the hop bill. Smells wonderful. M- There is a nice bitterness in the middle and afterwards, but nothing I cant handle, in fact Im digging the little kick it gives my mouth. There is a slight bit of alcohol coming through, barely enough to realize. A little lighter than medium bodied with not too much carb. A long aftertaste. D- I really enjoyed this. The flavors coming from the hop bill scream DIPA, and the bitterness is a bit high making for a very drinkable IPA. I wish i could have this on a daily basis, which in the future, i probably will. Painted 22 oz. bomber served into a pint glass. 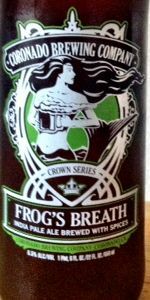 The Frog's Breath pours a clear light gold in color and with a half inch of off white foam. A light carbonation from the bottom of the glass is just enough to keep a surface cap on the pour. A second and more robust pour yields better results as perhaps it was a bit too cold initially. Offers a decent hop aroma wrapped up with a bit of lime in the delivery. Warming brings out more classic pine and citrus as the lime becomes more subdued. Not overly abundant and in fact a bit thin for an IPA however, yet fairly well integrated with spices. Light sense of lime follows on the taste of this brew. Light citric bready character in the middle and a certain astringency on the finish that isn't really a hop driven bitterness. A decently lingering finish closes with another quick flash of lime infused grain. Lime surely trumps the lemon and orange zest added to this brew yet it remains subtle which matches a subtle hop character as well. Overall an easy drinking IPA though largely due to a lack of hop depth with just enough citrus and spice and malt to give it a plesant albeit interesting balance. Pours a bright copper color with white head and soapy lacing. Smells of melon, herb, and caramel. In the taste, pine sap, citrus and a bit of caramel toffee. Light bitterness but not sweet. Pretty solid flavor. The feel is light and very thin. An easily drinkable brew, though a bit mundane. Overall, this is a decent enough IPA, but lacking in body and overall fullness. A: Pours a golden, copper in color with a small amount of head and lots of particulates. Carbonation looks average to mild. Head retention is pretty weak, quickly subsiding to a thin layer of creamy film. There is a little bit of oil left on the edges of the glass as you drink, but most of the foam doesn't stick. Not exactly a looker, but it does pique my curiosity. This may be the most particulates I've ever seen in a brew, which is slightly off-putting. S: Very prominent Centennial hops with an earthy, grainy undertone and lots of citrus zest with notes of lime, honey and a tiny bit of alcohol astringency. Not overly aromatic at first, but opens up a bit as it warms. T: Follows the nose pretty well. Citrus zest with notes of lime, orange and lemon. Some spiciness. Pretty well balanced with a bit of yeast and an earthy, buttery, grain that is hard for me to distinguish. Finishes with a lingering soapy, citrus hoppiness. Surprisingly tasty, the kaffir lime tangos nicely with the Centennial hops creating a very tangy, citrusy overtone that really pleases the citrus-hop enthusiast in me. M: Medium bodied with less than average but lively carbonation that tickles the tongue and a good amount of chewiness. Finishes crisp and a little dry but not overly so and certainly not a palate wrecker. O: Really glad to see more stuff from Coronado Brewing Company on the shelves in my local stores as they've always had a lot to offer but didn't distribute widely. I must say I had fairly low expectations for this one after the pour, but it was quite tasty and drinkable, which are perhaps the most important qualities. If you dig citrusy brews with a bit of balance, this one is for you. Cheers! Big commotion of hoppy aromatics is the best feature. Quite flowery and fragrant, and starts out with promise. Golden color in the Ommegang chalice, nice foam. Light body with just a touch of biscuity malt. Serious grapefruit pith. Totally bitter aftertaste. Love it or hate it. There is nothing to say about this. It's just the Centennial and Summit hops. If they actually added lemon, lime, and orange zest to this brew, it's silly because it is buried under the grapefruit rind. For some reason they felt obliged to put this in bottles.